Today is July 6. That means Father's Day was 16 days ago. I had planned to write a post about great bags for dads and even had this awesome guest post from an ACTUAL DAD (I know!). But, time got away from me .. and I didn't manage to get it out. However, I do still want to share Dethe's wonderful review of the Hamptons Hybrid laptop bag from BBP - so, here it is, without further ado. I was on the lookout for a new backpack that could carry my laptop and sundries. I am fortunate enough to live close enough to my job to walk to work, about half an hour each way, but my previous backpack pressed on my back, so I would get to work sweaty and uncomfortable, so the main feature I was looking for was good ventilation and some passing to keep the bag from pressing on my back as I walk. I also have an old back injury, so must carry the back on both shoulders or I get spasms, so good ergonomics are important to me. Trying out the Hamptons bag I was at first a little bit wary of the clasps. They are plastic and looked like they would not hold up well. Having used the bag heavily for a year now, I am pleased to report that the clasps, and the bag as a whole, have held up just fine, with no significant signs of wear. The bag itself rides low, which is good for my back, and has a nice pad to keep airflow between my back and the bag. It sits sideways, like a briefcase, so it looks a bit unusual (and can be somewhat tricky on a crowded bus), and this brings us to its more unusual features. The "hybrid" in the name is that this bag converts between a messenger-style shoulder bag, a two -strap backpack, and a briefcase. There are clasps and a snap which allow it to be adjusted quickly between modes. I use it almost exclusively in backpack mode, though I sometimes grab the briefcase handle for quick moves, like getting on or off a bus. I've only had occasion to use it in messenger-bag mode while travelling by air, when I already had a larger backpack with clothes and I was able to sling the Hamptons bag over it to get through the airport. The strap padding is good in either mode. There are also detachable straps for sternum and waist to help take weight off your shoulders, but I haven't needed them. As a bag, it holds my laptop well in a padded compartment. There is plenty of room for my lunch, a book, and a raincoat inside the main compartment, and plenty of pockets for power supplies, cables, sunglasses, water bottle, and more. Lots of pockets. There is a outer pocket that you can slip some papers or a magazine into, which unzips at the bottom to allow the handle from rollable luggage to be slipped through, which makes that pocket a bit insecure, since I've accidentally unzipped that pocket just carrying the bag around, and the there is one small pocket on the flap which is supposed to be held closed with a magnet, but the magnet used is too weak, so the pocket flaps open. Those are minor points, though, and overall there is a good amount of storage in this bag, and all of it is sturdy ripstop nylon. The bag is fairly water resistant as well. There is a rubber gasket over the zipper that closes the laptop section, which is showing the most wear from a year of use. Living in Vancouver, I frequently walk in the rain, and only once have I found any trace of moisture in the bag, and then it was a heavy rain, and only a trace of damp. On this score, it rates well above pretty much every other bag I've used, and I've been a bag junkie for 30 years now. All of that is for the good, but no bag is perfect and these are the downsides for me. This bag is fairly heavy, and I am trying to reduce every pound I can from what I carry. Some of the pluses above are to blame for the weight—all those pockets add weight, and so does the convertibility that I rarely use. I would be happier overall with a simpler version of this bag that was purely a backpack, with fewer pockets, if that would shave off some of the weight. Now, for most the convertibility would be a feature: I was more interested in the ergonomics. I mentioned earlier that this bag looks unusual. I was actually stopped on the street by a young woman who asked me about it. Like me, she walks to work, and she was looking for something which would be a backpack while walking, and convert to a more professional-looking briefcase when she was at work. I was happy to show her the conversion features and she was sold on the bag. So far this is the only bag I've ever had which has gotten me stopped on the street by a pretty girl. So for the ergonomics, I give this bag an A+. If you have a need for the conversion features, I don't know of any other bag this flexible, even if those aren't a winner for me. And finally, as a conversation-starter this is one-of-a-kind. Thanks, Dethe, for the review! Photos from Chris Kahney's review of the Hamptons Hybrid over at the Cult of Mac. 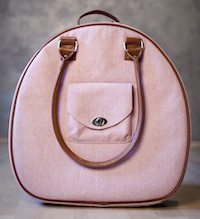 You can find out more about BBP's Hamptons Hybrid laptop bag at the BBP site. Thanks to BBP for sending a review copy! Oh, and if you're looking for other laptop bags for dads, you might find something at my cool and stylish laptop bags for men review site.